Omiya had just arrived back in the United States with other World War II wounded aboard a hospital ship from Italy. 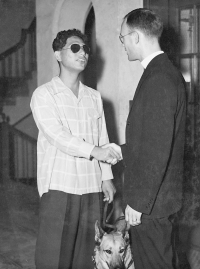 Unlike most of the other patients on the ship, however, Omiya was a Japanese American soldier from Hawaii who had served with the 100th Infantry Battalion, which, in time, would earn the nickname, the “Purple Heart Battalion.” Almost immediately, mail and gifts began arriving for Omiya at Stark General Hospital in Charleston, South Carolina, where he was being treated. The nurses, the training under the broiling Mainland sun, the horror of war, the buddies who lost their lives — those memories were now so distant. Omiya’s life now centered around the dimly lit living room of the neat and modest house that he shared with his mother, Matsu Omiya. For decades she had cared for her son. Matsu Omiya was a 52-year-old widow when she learned of her son’s injury — not from the U.S. War Department, but from friends who had heard about Yoshinao on the radio. Most likely, people who had seen the Life magazine photo had contacted the radio station. Prior to the war, Omiya’s parents ran a small grocery store near the baseball field in Moiliili. That field had filled Yoshinao’s youth with so much joy. He had been a captain and the catcher of the 1937-38 McKinley High School championship baseball team. In fact, his nickname, “Turtle,” was coined on the baseball field. As he talked, Omiya faced a recessed nook where pictures of his family covered the wall: his parents — Omiya’s father died before the war — a sister, two brothers, and nieces and nephews. An old clock that no longer told time still hung on the wall. In a sense, time stopped for Omiya on that fateful November 5, 1943 day.